A sunny spot where fennel’s tall branches will not cause unwanted shade. A short-lived hardy perennial, fennel will survive winter temperatures to 0F/-17C. Cosmos. Cucumber, squash, melons, pumpkin and other low, vining plants. Start seeds indoors in early spring, or plant them outdoors while the weather is still cool. Fennel flowers attract numerous small beneficial insects. 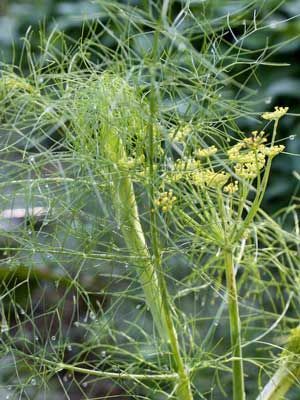 Gather fennel fronds as you need them in the kitchen. Fennel can reseed to the point of weediness. Gathering and using the blooms as cut flowers will prevent excessive reseeding. Prune back fennel plants in mid fall, before cold weather turns the plants to mush.